TA Stalker lets you quickly find out if your TA is currently in their office. Getting help on HW never was this easy! 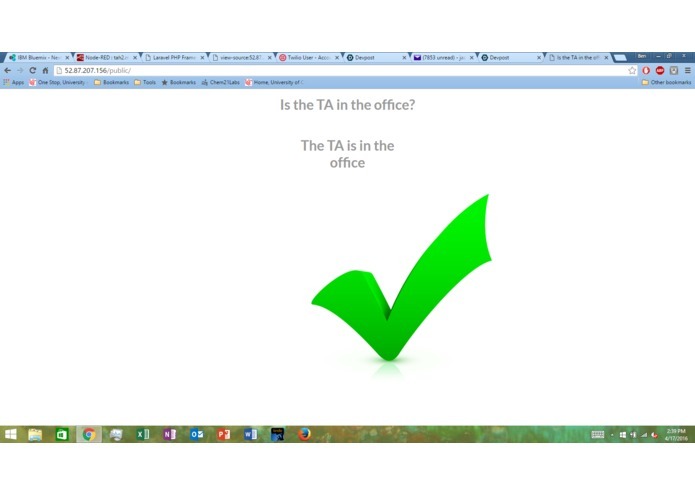 Portal for students to view if their TA is in their office! The entire point is to link the professor and teaching assistant's mobile devices to IBM Bluelink's node red to track geolocation. Once the location is tracked it will be compared to the location coordinates of the professor's office and if the coordinates of the mobile device are within a reasonable coordinate range within the coordinates of the professor's office a message will be sent to a website that will say the professor or his teaching assistants are in his office. It would be helpful for the students to know exactly when their professors are in their offices and do not have to take time to send emails back and forth to find out. We used node red capabilities to track the coordinate locations of one of our group member's mobile devices and then if the coordinates were in between a certain distance it would say that the teaching assistant or professor was in the office or not. We also built a webpage that we would try to send the message to so many people could see it for practical use. Bluemix is somewhat experimental right now and there were some problems figuring out how to use it. Once most of the bugs are fixed it should be a fantastic program to use, but it has some slow load times on the servers and there was a point where our node red project was corrupted and our group had to start over. We start off as 4 total strangers, and we managed to put together a project from scratch to a living service. 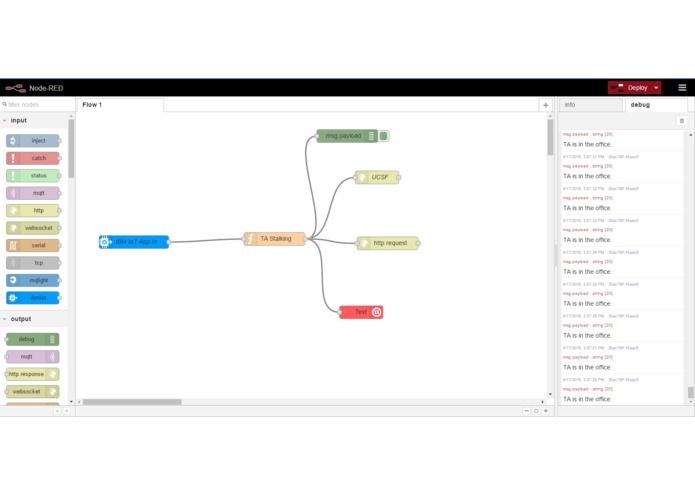 It's far from perfect, but giving the complexity and different level of knowledge involved, we are proud to say "we learn, we hack we ship and we grow"
We had some very extensive exposure with IBM IoT platform over the last 24 hours. We played around with a couple of communicating protocols and different ways for accomplishing the same thing. I came up with the general idea and structure of TA's Here. Being a TA myself, I like to help students and received hundreds of emails from students over my years in graduate school. TA's Here is a little side project I had always wanted to release my information to students in care. Aside from the architecture, I also managed to setup the environment with ibm bluemix , division of labor and workflow. I learned a ton about the BlueMix programming and the capabilities of Watson. It is definitely a large learning curve. I also contributed to connecting other devices to the network. I setup the web server and built the website.